The piece above is the first in a series of experiments to find a visually exciting interpretation of that fascinating and powerful number, Pi. Such a potent and intriguing number must have an equally compelling visual interpretation. This is the starting point. Here Pi is represented to 440 decimal places. Each digit is simply represented by a square in one colour, reading left to right on the top and alternate rows and reading right to left on even rows. Odd numbers are represented by warm colours and even numbers by cool colours. The sequence begins 3.141 etc.. This piece was created to see how the colours, in this seemingly random number, would cluster and form patterns. Above, another simple expression of that mysterious number, Pi. Made with just 10 saturated colours, chosen for their contrasting tones, this piece differentiates between the prime numbers in Pi and the non-prime numbers. The non-primes are in blues and greens, and the primes are represented by white, red, orange and yellow. It is fascinating to see how the colours clump and form patterns within a seemingly random series of digits. The decimal point is represented by a button and the piece reads left to right in all rows, starting top left. Four different expressions of Pi - that fabulous number that enables us to do calculations with circles - are each stretched over a canvas frame, then mounted on a fabric covered backing board. Each have a decimal point represented by a button. The pieces all read left to right. 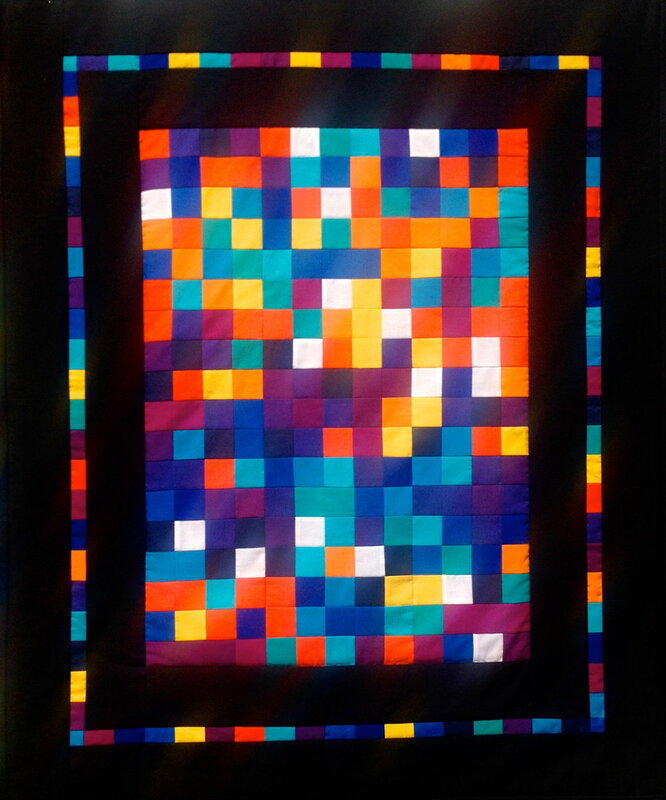 * hand quilted "in the ditch"
After the fun of Pi: 1, it seemed a logical step to introduce more colours and to experiment with triangles to add more visual interest. Pi: 3 uses 21 colours. 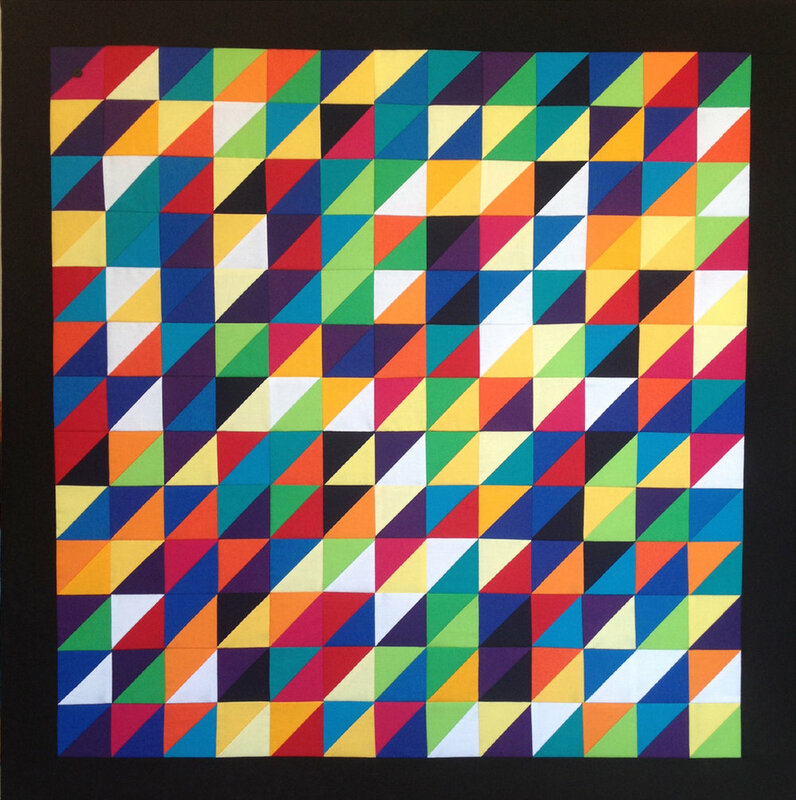 The piece is 13 squares (26 triangles) across and down, each row using a sequence of the 21 colours. 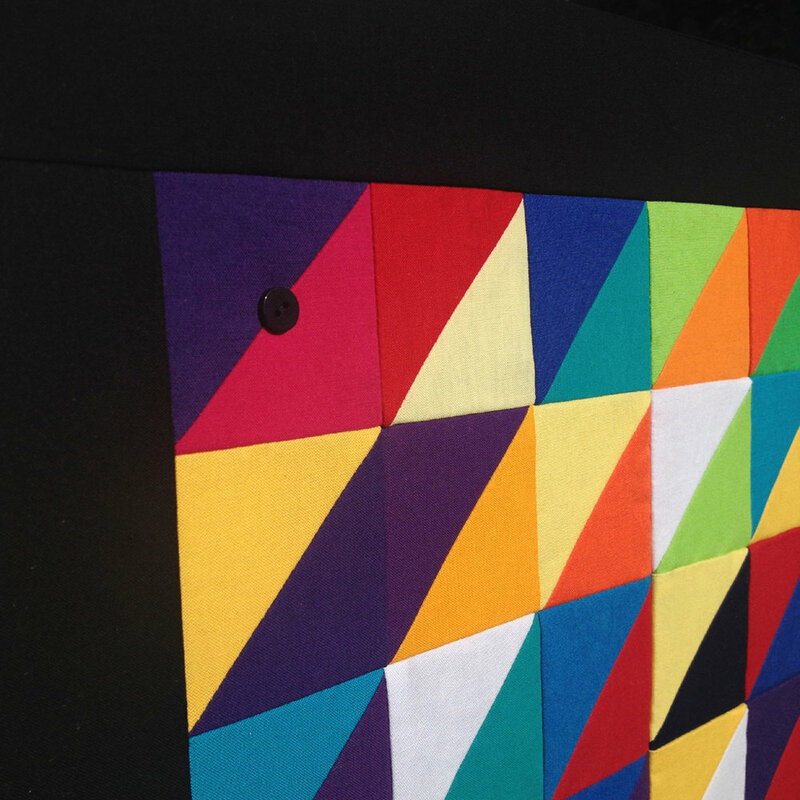 Over the whole piece, each number is represented by every colour, in strict mathematical rotation. All rows read left to right, from top left. 18 colours and white are used to represent Pi. Each number is represented by two colours, used alternately. Therefore, in any horizontal row, no two triangles of the same colour should appear next to each other. Using white, or a very pale neutral, increases the vibrancy of the work. A shade of white is used to indicate the digit "0" throughout. A button represents the decimal point and each line in the piece reads left to right. See gallery: Fibonacci and gallery: sequence. Many of us remember pi (π) from our schooldays – we used it to measure circles. This unfathomable number was known by Archimedes as early as the 3rd century BC and has intrigued mathematician ever since. They have worked it out to at least 2 quadrillion decimal places – and have still not reached the end of it! It appears to be random, yet the sequence 999999 occurs after 762 decimal places, and again after 193,034 decimal places. Why? After 17,387,594,880 decimal places the sequence 0123456789 comes along. Why is this? What other secrets does pi hide? Is the sequence of digits actually random? And can we ever know for sure? Some even believe that when pi is uncovered to quadrillions more decimal places the only digits present will be 0 and 1. Will we ever know?